A friend asked me if I was enjoying Ice Like Fire and my answer was “it’s OK”. It is the type of middle book that is needed in this series but that I don’t typically enjoy as much. The fascinating world-building happened in the first book, I know the third book will likely bring more exciting adventure, but this second one is filled with uneventful ground-laying for things yet to come. (This trilogy isn’t the only book series to suffer from this problem). Don’t get me wrong, I still want to eventually read Frost Like Night to find out what happens to Meira, Mather, Theron, Ceridwen and everyone else, but I didn’t find Ice Like Fire nearly as exciting as Snow Like Ashes. In this book, Meira is traveling to several different kingdoms in Primoria to find allies. Theron, Prince of Cordell, is with her but their agendas do not always align. We meet a few new characters throughout and I really appreciated Ceridwen, princess of Summer. Many of the rulers do not rule in a way that Meira finds acceptable and she learns much about being the ruler she needs to be…what to do and also what NOT to do. Mather and Meira are separated for most of the book but honestly my very favorite parts were the ones from Mather’s point of view. The once-king makes new friends and together they secretly take up the responsibility of protecting Winter from Cordell in Meira’s absence. I am excited to see what becomes of him in the final book. I think we will see great things from him. Do I recommend Ice Like Fire? Well, I recommend the series as a whole. But if you are like me you won’t stay up late into the night reading Ice Like Fire because you simply cannot put it down…this is just not that kind of book. If you are about to read Ice Like Fire and need a refresher on the first book, read our recap: What happened in Snow Like Ashes. 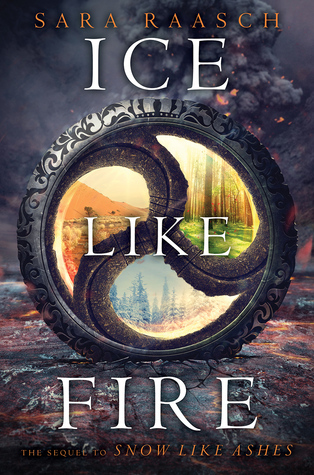 Sign into Goodreads to see if any of your friends have read Ice Like Fire.